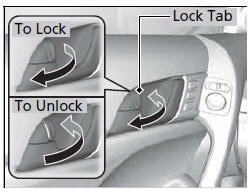 Pull the lock tab rearward. Push the lock tab forward. When you lock the door using the lock tab on the driver’s door, all the other doors, trunk, and fuel fill door lock at the same time. When you unlock the door using the lock tab on the driver’s door, only the driver’s door will unlock.